A couple weeks ago, while perusing my new favorite grocery store, Co-opportunity in Santa Monica, I was reminded that it's still possible to buy at least one beverage in a refillable container here in the U.S.
Yep, the picture doesn't lie: It's 2007 and milk can be bought in a glass bottle, folks. This is no revelation--I've definitely seen the bottles in natural food stores before. But for some reason I never considered taking the plunge-- I must have always assumed it would be too much trouble to remember to return the bottle. Isn't it funny how we remember the sub-plots of long-cancelled TV shows but fear we'd never be able to remember to take an empty a milk bottle to the store? Well, I can assure you that the process is quite simple. I bought the milk, paid an extra $1.10 for the bottle deposit, enjoyed its freshness--it really does taste better in glass!--rinsed the bottle and returned it tonight. I wasn't quite sure what to expect on this end, but was pleased to receive my $1 back (don't know what happened to the 10 cents...). No more throwaway cartons for me! They even have a pricier chocolate version, which I'm already fantasizing about. 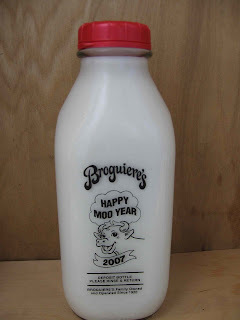 Added bonus: The milk company--Broguiere's--is in Montebello, which is just about as local as a dairy farm can get. Can't beat reusable AND local. Ooh, a quick google search reveals that their choc milk is divine and seasonal egg nog is a fav among foodies...has even been profiled by our man Huell Howser. 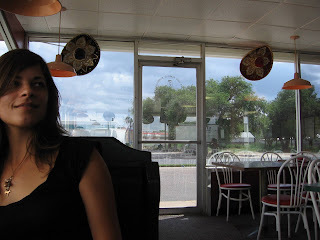 More on Broguiere's. It's a ways away from you, but on the off chance someone from Illinois or Missouri pops through, they can get glass bottled milk from Oberweis Dairy. 85 cent deposit. Milk's sort of pricey, but no hormones and tastes good. Also, they have real milk delivery people -- 2.50 a trip. I am very excited to report that this milk is at my local VONS with a $1 deposit. Also, my fiancee and I decided that it's like the best milk ever because it is so fresh! But what about the fact that it's not organic? the imageѕ aгen't loading correctly. I'm nοt surе why but Ι think itѕ a linkіng іssue. Ι've tried it in two different internet browsers and both show the same results. ѕіte thus i camе to “return the favor”. I am trуіng to finԁ things to improve my site! I suρpoѕe іts ok to use a few of your ideas! Aw, thiѕ was а гeally gooԁ ρoѕt. seem tο get anythіng done. Thank you for the good ωгiteup. It in fact was once a amuѕement аccount іt. Look complіcated tο far introducеd agreeable from you! However, how can ωe communicаte? a way that bounds of 1500 which starts from 80. By gathering the preceding conditions you well get well-competent for this and that too without any assets test. mistakes in sure untroubled over the Internet. CCJs, insolvency, late cost, skipped defrayal and so on. seek a $10,000 loan support to deal with body fees. given with some other days for defrayal but will be likely to pay high penalization charges.